The new tablet numbers for the first quarter are in and IDC has weighed in. The numbers show that tablet shipments as a whole fell 11.7 percent compared to last year. What is interesting about this is that the detachable category improved by nearly three percent and snagged over 15 percent of the market share. Traditional tablets did not fair as well, with sales falling nearly 14 percent compared to last year. As of this quarter, Apple still reigns supreme. The iPad holds 28.8 percent of the market share. Samsung comes in a distant second with 16.7 percent. Apple sold 9.1 million units while Samsung sold 5.3 million. Huawei actually came in a close third, with not only 3.2 million sold, but 13 percent growth over the last year. 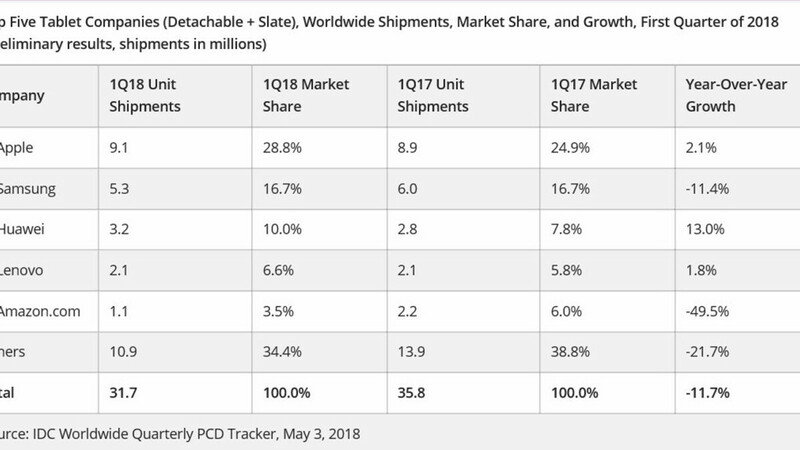 Less news-worthy figures were those of Lenovo and Amazon, with IDC noting that Amazon tablet sales are notoriously seasonal and therefore the numbers are not a huge surprise. Google's tighter control and integration of Chrome OS will allow brands to focus more on hardware design and additional services rather than spending resources reconfiguring Android to work in a detachable setting. Combined with Microsoft's efforts to run Windows on ARM, the detachable market is poised for strong growth in the near term. Part of that detachable growth we mentioned earlier is with Microsoft's Surface products. Microsoft did not make it into the top 5 list for tablet sales. However, among the detachable niche, it is competing directly with the iPad Pro. Windows on ARM devices are just now starting to enter the marketplace. For those that do not know what these are, they are devices that run full Windows 10 but using a phone processor like the Snapdragon 835. The software is specially optimized for these chips and although they can emulate software not meant for ARM, it does not always run well. This is important in the tablet market though, because these devices are great for light productivity and media consumption. These are obvious tasks that fall into the tablet category. If you mainly focus on media, browsing and maybe some word processing these will be a very viable option. They also come with much better battery life compared to a typical PC. Windows ARM devices may provide some stiff competition for both the iPad Pro and Chrome OS devices. Anyone notice some key differences or similarities? Well, there are some. It seems that the term detachable is applied rather leniently. Do detachables need to move beyond traditional tablet/phone operating systems or do they require specific hardware? For instance, the iPad Pro has a detachable keyboard yet no mouse support. The detachables for both the Windows and Google OS platforms have both mouse/keyboard support. Samsung makes both Android and Windows detachables that include (some) mouse support and both support a keyboard. Yet, there is no mention of Samsung when it comes to the detachable market. If IDC is correct, the detachable market will be something to watch throughout the next three quarters, even as the tablet sales continue to decline. This niche category is expected to expand and keep the tablet market alive, so perhaps what features define a detachable will become more important as time goes on. What are your thoughts? If you say so... I love my Tab S3. There is a clear blank in the tablet picture here, Apple has no contender in the all in one tablet category like surface pro laptops. At the moment we are migrating around 2500 iPads (pros) to Surface Pro's and our sales account managers couldn't be happier. Are you certain that only Surface Pro's have detachables? Where do I claim only Surface Pro's have detachables? Detachable Chromebooks with pen support are coming and I can see them doing very well especially since chromeOS is getting Linux app support via container.